Ironically enough, the final semester of my undergraduate experience has been leaving me feeling unfulfilled. I’ve fallen into a routine: a combination of draining schoolwork I don’t entirely love, and weekends attending the same campus bars we’ve all been attending since we were at least 18. This isn’t about my dull day routine or meaningless nights at bars, however. Feeling empty from both, I decided Saturday was a great opportunity to take a personal night. I say personal night with a few connotations in mind. First, as in taking a personal day off from the robotic work that constitutes my passing weeks, and second, personal as in concerning the intimate needs of my mind, body and soul. My roommate and I had already slept in, feng shui-ed our kitchen (by washing dishes) and rid ourselves of some toxins at the sauna earlier that day, so I was feeling wonderful about a night to myself. Light on toxins, I decided to make some chocolate chip banana bread for dinner. Yes, you read correctly. We had four bad bananas and I was in the mood to test my creativity and face my domestic fears, so I went all in. And by all in, I mean substituting nearly everything that this recipe called for with other items- like avocado for butter- and the result was something SUPERB. Boom! Another kitchen experience down. It felt great to challenge myself in something that lies beyond my comfort zone. It seems silly to feel insecure about following a recipe (there are high cooking standards in my family- it’s deliciously overwhelming) but it’s a fear of mine that I’m tackling bit(e) by bit(e). But by identifying and confronting a fear of mine, I exercised my mind and my soul. Just like the body and the brain, the soul needs exercise to stay fresh, healthy and ever-growing, too. When you acknowledge and address the things that make you uncomfortable, you keep your mind and soul flexible and in progression. If you don’t “practice,” the body, mind and soul all get stuck in their ways and become incapable of growth. So practice I did. Part two of my personal night actually involved my cell phone, which I had turned off earlier as part of my me time. I had discovered a meditation app called, Stop, Breathe & Think, last week and it’s actually very lovely. The app asks you to assess your mental, physical and emotional well-being and then offers you various applicable podcast meditations. I don’t believe technology can ever supersede true meditation or mindfulness, but I do think this is an example of technology used in a beautiful way. You all should give it a try! Whether it was an overdose of banana bread and soulpancakes or just the night’s happy energy, I remembered my positive affirmation cards for the first time in a while. 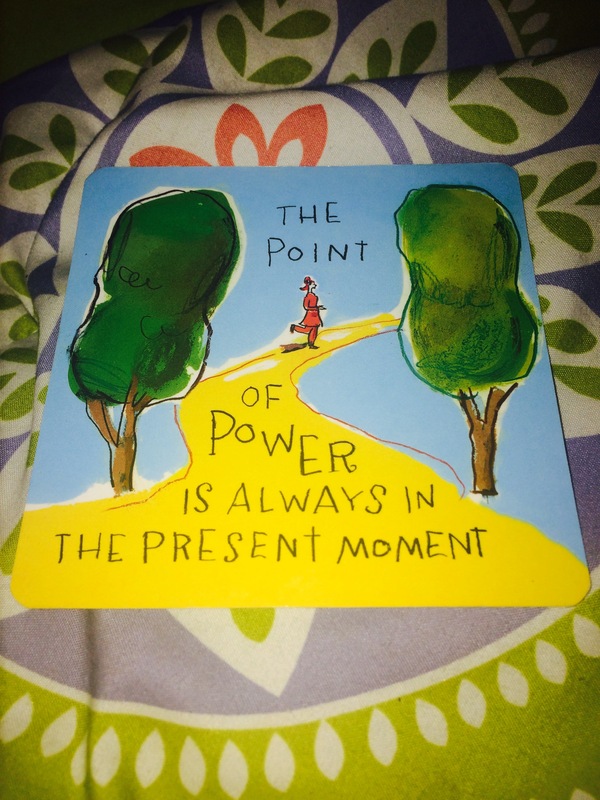 (Lousie Hay, the creator, calls them power thought cards. They are fabulous). A dear friend of mine introduced them to me a few years ago, and I loved them so much that she gave me her deck. I’ve been trying to pay her kindness forward since then, sharing my cards with others and letting them have one or two that they resonate most with. All in all, it was just the night I needed. I had to take a break from that which was leaving me unfulfilled and spend my time doing the things that filled me up and made my life feel meaningful. The takeaway: do that which nourishes your individual soul. Do what feels good, what has value, what makes you feel like you have a purpose. These days, it’s all too easy to get lost in the things that need to be done, the things we should do or have to do. What about the things that serve no purpose other than making you feel good? Check in with yourself every once in a while. Part of being grateful and appreciative is being aware: aware of your own feelings and well-being; aware of other’s emotions and health, and aware of the environment and surroundings that encompass us all. We all suffer from FOMO to an extent, and sometimes I feel that applies to me more than anyone. But I’m learning that taking care of myself and doing the things that are most fulfilling to my mind, body and soul is essential to any rewarding experience I can share with another person.